Eat Your City: Sushi Wasabi Edmonton, AB - Best Traditional Japanese in Edmonton.. NOM! Sushi Wasabi Edmonton, AB - Best Traditional Japanese in Edmonton.. NOM! Classically trained in Japan, the chef immigrated to Edmonton about 20 years ago, and has been crafting and creating Japanese dishes with heart and care since. Seeing an opportunity to run a traditional Japanese restaurant in landlocked Alberta, I'm very very thankful he decided to set up shop in Edmonton. 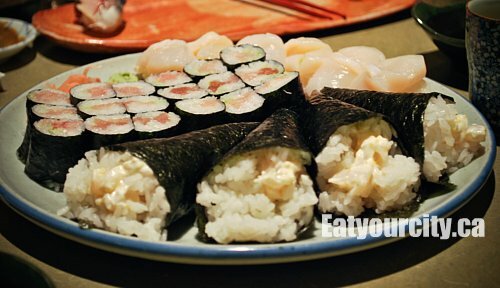 By far the most consistent Japanese restaurant in Edmonton, as it has become more well known over the years, patrons have shifted from mainly Japanese families to a more mainstream clientele with a good sprinkling of Japanese customers amongst Chinese, Caucasian and Lebanese families and couples out on a date. Family members in traditional dress comprise of most of the staff, with the chef's wife never without a smile as she bustles around either checking on patrons or creating dishes in the kitchen. Service is always exceptional, and being a regular for years, they tease us if we don't order some of our usual items off the menu. Quality is of the utmost importance, and the chef grates wasabi fresh as he uses it - with a traditional grater thingy and a fresh wasabi root - it looks like a super ugly potato. A small selection of hot and cold sake is available amidst the usual soda pop if you don't feel like green tea with your meal. The freshly steeped green tea with wonderful aromatic roasted puffed rice nicely cleanses the palate, though I prefer hot sake over cold as it leaves a refreshing aftertaste with floral notes, while the cold sake tends to have a harsher bite to it. Since we've tried nearly everything on the menu (I've had natto before, and I'm never ever having it again), I'll list off the favs - if there isn't a picture yet - I just haven't had time to dig out a nice one and post it - but they will come! Sliced with precision and with generous portion sizes, the freshness of the seafood used in the sashimi items is comparable to the higher end joints in Vancouver and Japan. Translation - probably the freshest sashimi you'll have in Alberta, period. Maguro (tuna) sashimi is rich, creamy and entirely lacking the strong fishiness you'll find at any other Japanese resturant. 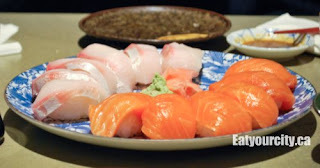 Sake (salmon) sashimi is tender, silky smooth and has a subtle sweetness to it - totally addictive nom! Combining perfectly seasoned slightly tangy sushi rice into a compact morsel with a swipe of freshly grated wasabi and topped with excellent fresh sashimi.... nomnomnom!!! I strongly suspect the seafood used in the nigiris are higher quality than for the sashimi, but it could just be the seafood and rice complementing each other so darn well. Mackeral has a slight sweetness along with its characteristically strong flavor and is a moderate firm mouthfeel - being landlocked, its impressive that Sushi Wasbi is able to source mackeral that is notorious for deteriorating quickly into a mushy texture or overpoweringly pungent. Octopus is lightly blanched and sometimes marinated briefly before being sliced into a sweet savory morsel that has a bit of give without being too chewy. Hotate-gai (scallops) A whole scallop is split and served - super simple and super tasty as the scallop is sweet with a light salty flavor inherent in all food from the sea, and ever so tender. If it wouldn't break the bank, I could eat whole a bowl of those scallops.. yom! Unagi (freshwater eel) is grilled and slathered with a teriyaki sauce - tender and usually not cooked to the point of dry flakiness. They are probably the only place in Edmonton that serves Anago (sea eel) - very different from freshwater eel that we're used to - it has a slightly smokey sweet flavor. Lightly seared and sliced paper thin, its a little piece of heaven on earth... garnished with diced green onions. The silkiness of the paper thin beef melts in your mouth and contrasts nicely with the crisp bite from shaved red onions, sharpness from the grated diakon while the salty savory tangy in house ponzu sauce adds depth and balances out the entire dish. Sadly, this dish always disappears too quickly, though if the beef sat in the sauce for too long, the acidity of the sauce will cook the beef for those who like their beef a bit more cooked. Live a little and try it the way it should be done. Tempura Light, crispy and well drained of grease, the shrimp tempura is cooked perfectly and paired with a in house tempura dipping sauce that has hints of ginger. The assorted is a favorite as it has a mix of tempura'ed squash, broccoli, zucchini, yam, carrot and shrimp. If you're feeling extra decadent, they have lobster tempura too. Shishamo maki - the inside out roll with a tempura'ed smelt (full of tasty roe that pops with a delightful sweet burst), creamy avocado, crisp cucumber with a trace of japanese mayo that ties all the flavors together into yummmm. A bit more pricier dish, but well worth it - its cooked into the most tender and succulent calamari I've ever had. The slight smokiness from being grilled to perfection over charcoal adds to the savory light ponzu sauce and makes for a dish that you don't want to share. The wakame salad is a light and totally addictive mixture of fresh bright green wakame seaweed and toasted sesame seeds tossed in a light tangy sesame dressing with a small hit of chili peppers to keep things interesting. The only downside - the portion size is a little bowl and its so addictively good, you want much much bigger big bowl of it. The sunomomo salad has a few pieces of blanched octopus slices, a sweet shrimp, a chunk of imitation crab and a handful of kelp atop of glass noodles all floating in a light dressing. The dressing though very acidic marinates and infuses flavor into all , pulling all the random elements together into a cohesive and fun dish to slurp up. One of its signature dishes, you may have to wait for an available pot in the cold winter months as its very popular. Texturally complex - Tender udon noodles swim with fresh veges (enoki mushrooms, shitake mushrooms, suey choy, carrots, green onions, whatever is in season), seafood (black cod, shrimp, salmon - varies), tofu chunks (soft or deep fried), fresh chunks of chicken, kelp, and an egg poaches to perfection in a light broth all served inside a large cast iron pot that keeps everything piping hot. A smattering of tempura bits give it an additional richness to an udon that exemplifies simple, hearty and comforting. 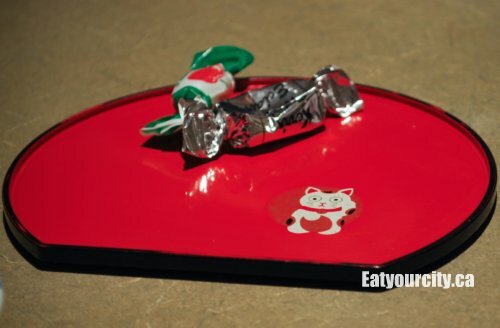 Perfect for sharing with 4-5 others, or for 2 hungry people mmmmmmm. Watch for this one as it only appears on the blackboard of specials occasionally. 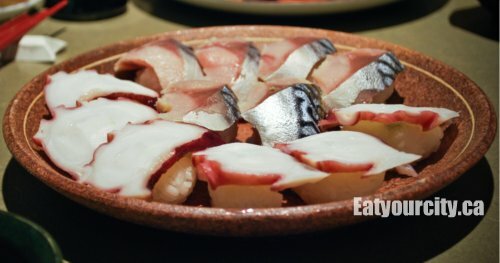 Fresh horse mackeral is sweeter and has a firmer crisp texture than the typical mackeral. 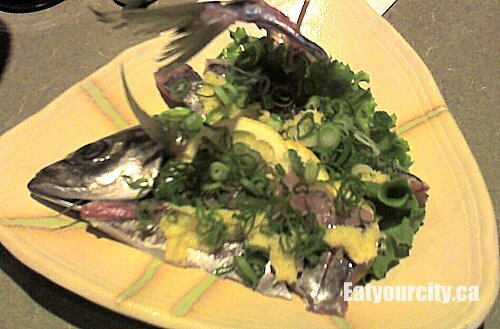 The special is first served as sashimi, garnished with grated gingeroot, lemon and green onions adding a flavor punch that works with the mackeral without overwhelming. The rest of the fish is then deep fried and served with a bit of fleur de sel and a ponzo sauce - the fish is so crispy, the bones can be eatten - like chips! You can alternatively ask for it to be grilled - over hot coals and seasoned with a bit of fleur de sel. I prefer the sashimi/fired version - its like two dishes in one, but the charcoal grilled version is also quite tasty. I've never had room for dessert, though they do offer a couple traditional choices beyond the green tea icecream. Not a clue what they are, cuz we're usually too too full and in a state of food coma at the end of the meal. They kindly offer a gold wrapped werther's original or random Japanese hard candies as a small sweet end to the night. 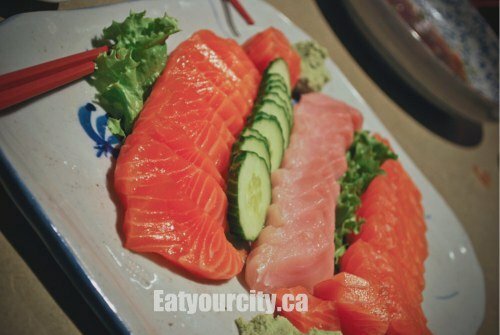 Overall, the best Japanese restaurant in Edmonton in terms of consistency, quality of the sashimi, attention to detail and training in the knife skills. If you can't get a table as they're always super busy, call ahead for takeout. The chef will refuse to sell you scallop sashimi/nigiri as take out though - he feels it doesn't taste as good/right in a take out box, but will happily serve it to you in the restaurant the proper way. Go, eat, and if you get to dessert without food coma-ing, let me know how their desserts are.